← A powerful piece by “Mountain Magic” on the tragic events on the Avalanche on Ben Nevis. Sadly no hills. Thoughts of two good pals . They make you think how lucky we are . Little things like eyesight snags and a great Scottish rugby result. Sadly I never got on the Moray Mountaineering Club Bus to Dalwhinnie today my cough was back so I have to take it easy and a wet cold day on the hills is not what I need. I hope they take care as the weather is not great. Its hard sitting in but I doubt the hills are in great condition just now. Its been pretty bad for me this winter so I have not been out much on the hills old age taking its toll. I have had bronchitis with a cough on going since the USA bike trip. It getting better but I have to be careful and wet cold days are not what I need. Also I have cataracts in my eyes and due to a huge waiting list on the hard pressed NHS I have had to go private and will be done in Glasgow at the end of the month. The waiting list just to see the consultant was 47 weeks and as I live on my own I have had to do this. To me its sad but there is no way I can wait well over a year plus to get sorted. I have had bad eyesight all my life but its pretty bad now I do not drive at night at all. I have had a few problems on the hill recently in failing light or heavy snow so that is also why I am not out so much. This week was an Anniversary of losing two great pals on a winter climbing accident in Lochnagar. 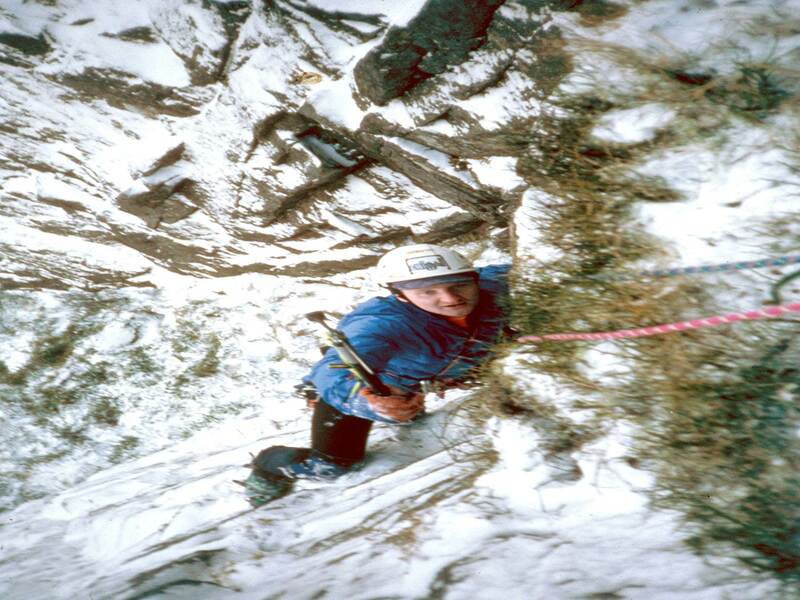 Mark And Neil were great pals who fell winter climbing. It was in 1995 yet seems like yesterday. The Sea king and my pals in Braemar brought them of the hill. It was a terrible time and I took 2 months of Rescue work as it effected me so much. The teams and friends helped so much and there was so much to be done to help the families. I had lots of experience of this but it hurt so much. Yet during this time there was great support from my friends in Mountain Rescue and the police. I was very close to them both and had known Mark since he began climbing with the RAF Kinloss MRT. They were both at the top of their game and it took years to sink the complete tragedy to all their family and friends. They were in the prime a formidable team especially in winter. They had climbed so many great winter lines. They were so full of life and we were all devastated. Myself and Dan had a dram the other night in their memory. It was such a long time ago but still hurts. I was moaning about my eyes etc yet how lucky are we to be still fit enough to do so much. Mountaineering takes so much at times and especially after recent tragedies. It can be a hard game and it’s always worth being as careful as you can no matter how good you think you are. At times the mountains take a horrendous price for the joy we get. These were hard winters with lots of tragedies which we were involved in. I soon got back into Rescue work but it was taking a toll. Lochnagar would never be the same for me again yet I did winter climb there a few times. It is such a majestic mountain. Yet part of my enthusiasm for winter climbing was lost there. Yet I have managed to pass on lots of advice to climbers through the talks and the blogs. At least you feel you are educating folk. Yet at times we do think we are invincible when we’re young strong and fit. Nature has a way of reminding us and we must listen and learn from all experiences. I am so lucky to still getting about and soon will be fit to climb or cycle again. On the brighter side what a result by Scotland in the rugby it made my day listening to it on the radio. It was thrilling listening to it especially as they were 31 points down. It gives you faith and thanks to Dan for coming round and the good night we had remembering our buddies Neil and Mark. Neil in action Bold, Brave and Strong. This entry was posted in Family, Friends, mountain safety, Weather. Bookmark the permalink. 2 Responses to Sadly no hills. Thoughts of two good pals . They make you think how lucky we are . Little things like eyesight snags and a great Scottish rugby result. I had not realised that 25 years had passed since the loss of Mark and Neil but I always remember around the date. At that time I lived in Hopeman with my ex partner, Nick.and we knew Mark and Libby quite well and attended both funerals. It was good to see the photo of Mark. Like you I have always had terrible eyesight and a few years ago had a series of major problems with my eyes. The amount of surgery I had resulted in a cataract in my right eye. The good news is that these days you can get the replacement with a ‘prescription’, a bit like having an inbuilt contact lens so although you might still need glasses they will not have big thick lenses so will be cheaper and you can see where you are going in the middle of the night! It’s a shame you are having to pay. I received an excellent service at Ninewells in Dundee and I suppose because it all started as an emergency not long to wait. Good to hear from you glad your sorted hope to be fixed by end of April!